You gotta click the link (bottom) to see the film! (Jody Bourton/BBC News, 12 May 2010) — Walruses have been filmed attacking spectacled eider ducks in the Bering Sea, behaviour never seen before. Walruses are known to feed on bottom-dwelling animals such as clams, so it is highly unusual to see them attempt to catch and eat ducks. A BBC natural history crew captured footage of the odd behaviour from a distance using a specialist camera mounted on a high-flying helicopter. Details are published in Arctic, the journal of the Arctic Institute of North America. The spectacled eider (Somateria fischeri) is a large sea duck that breeds on the coasts of Alaska and northeastern Siberia. During winter and spring migration they gather in huge flocks on the Bering Sea, concentrating in relatively small areas of open water within the sea ice. “This is where the world’s entire population of spectacled eider comes during winter,” says Mr Jeff Wilson, who directed the shoot for the BBC natural history documentary Frozen Planet due to broadcast in 2011. Studying and filming this spectacular gathering is difficult, due to the remote location. However, in March 2008 the film crew joined a scientific research expedition to the region. … Using a ship-based helicopter, Mr Wilson and cameraman Mr David McKay flew over the sea ice to film the ducks from high-altitude. As they did so, they noticed some unusual activity on the surface. “There were certain pockets of ducks that started to fly away in big starbursts. It’s not normal for ducks to expend energy like that,” says Mr Wilson. “Suddenly in the middle of the starburst a walrus came up. It then started to chase the ducks. 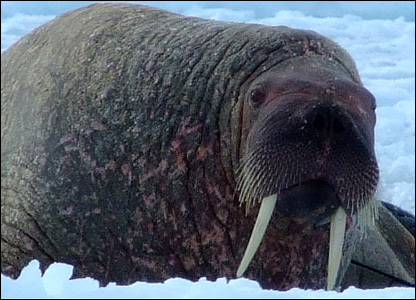 It was pretty obvious it was hunting them.” During 75 minutes of filming the walrus made eight attempts to catch a duck. The behaviour is so unusual that it has been studied by zoologist Professor James Lovvorn from Southern Illinois University, Illinois, US, who wrote up his findings in the journal. Walruses have previously been known to feed on birds, but the majority of their diet consists of molluscs and small prey found on the sea floor. “No one has reported such attacks on large flocks of ducks by walruses before,” Prof Lovvorn told the BBC.